Two seminal albums from a seminal band, finally again available for your listening pleasure, collector's needs and human enlightenment. Let's check out how these recordings hold up today; but first some history. The Feelies has been on and off for 40 years now, with a meager output of only 5 albums. At the center all these years have been Glen Mercer and Bill Million: Mercer writing most of their material, doing the vocals and playing lead guitar; Million sometimes joining Mercer in the song writing and vocals, but always playing that hallmark, intense, at times ecstatic rhythm guitar. The first ten years a number of drummers and bass players made up the rest of the band, until the ensemble was fixed with Stan Demeski on the drums and Brenda Sauter on the bass. Dave Weckerman, having occasionally occupied the drum chair, kept on lurking behind the scenes - always ready to shake a maraca or pound away on a cowbell. No denial, to be able to appreciate the art of The Feelies, there are some barriers you need to break. Challenge yourself: Why do rock musicians really have to look and act like a human wreck, society dropout and/or fashion icon to create great music? The Feelies guys looked like high school geeks when they started, and keep up that 'ordinary people' appearance throughout their career. Well, this might not be that rare nowadays after the low fi hipsters came along, but remember, these were the 80's. Disregarding appearances, the proto-punk musical references of The Feelies shine through: First of all, the droning qualities of The Stooges a lá Funhouse, combined with the dry, cool and slightly off-the-note vocals and the cymbal-free drumming of Velvet Underground. Add to that an extraordinary melodic sensibility in guitar solos in the vein of George Harrison and Tom Verlaine, and you might get a glimpse of the picture. Only Life captures The Feelies at the end of their most glowingly fruitful period, and is up there along with their first two albums (Crazy Rhythms, Stiff 1980 and The Good Earth, Coyote-Twin/Tone 1986). The Good Earth established the unique acoustic guitar droning style of Bill Million, probably a remnant from hours on hours of living room jams (which is how these guys like to have fun), supplied with Glen Mercer's one of a kind guitar solos. Add to that the latter's low mixed, mumbling vocals, some wayward percussion and drumming - and you get the basic ingredients of that album. Much of this is continued on Only Life, but a tad more streamlined, like if the band is suddenly facing the crowd in a concert instead of facing each other in a jam session. A cornucopia of brilliant, timeless beauties are presented, including one of my all time top favorites by any band: "Higher Ground". Time For A Witness (A&M, 1991) was planned to have a more straight rock feeling to it, with less guitar droning, less mumbling vocals; i.e. less of what made The Feelies special. At the time, I found the result quite disappointing; however, there are great songs on this album as well, like "Find a Way" or "For Now". And then, just as some of their 'alternative' peers like Dinosaur jr. were lifted out of obscurity by the Nirvana flood, Time For A Witness was released - and The Feelies disbanded. 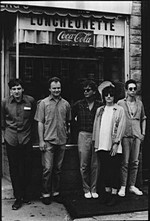 In 1989 A&M was bought by Polygram, and the personnel supporting The Feelies disappeared. So by the time Time For A Witness was recorded, much of the label backing had gone sour. At the same time, to enable larger venues and longer tours, the band's crew grew to outnumber the band members, draining what could have been some butter on the bread. This to growing frustration for Mercer and Million, who only wanted to make and play music. Thus, at the brink of releasing Time For A Witness, Million had had enough of the disappointments and borrowing money from friends, and left for a locksmith job in Florida - without informing the rest of the group. The story could have ended there. Luckily, on the initiative and encouragement by Sonic Youth, in 2008 The Feelies reunited for some gigs, which led to new material being produced and the 2011 release of the album Here Before. There are even rumors of a new record being released this autumn. But if you want to dive into what The Feelies are all about, time with Only Life is well spent. If not guaranteed to increase your life expectancy, it will most probably increase your joy of life. 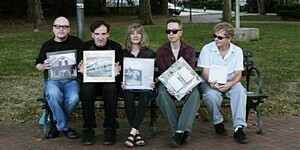 Check out this Feelies site, or this rather fresh interview for Salon magazine. You may also want to check out our Feelies articles/reviews: Crazy Rhythms, Here Before, Live at Helsinki Hudson (Hudson, NY) and at The Bell House (Brooklyn, NY), May 17 & 18, 2013.